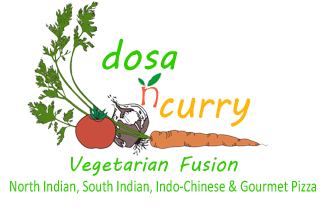 Online ordering menu for DOSA N CURRY. Dosa N Curry in Somerville, Massachusetts, is a Vegetarian Fusion Restaurant serving North Indian, South Indian, and Indo-Chinese. Our restaurant is 100% Vegetarian and our kitchen is free of eggs, meat, fish and animal by-products. Some of our appetizer dishes include Dahi Vada, Papdi Chat, and Sundal. Our tasty soups include Hot & Sour Vegetable Soup and Tomato Coconut Soup. Don't forget to try out our Rice Specialities and Indian Bread! We are located just east of Harvard by a few blocks. We are also near Somerville High School and Tufts University! Order online for carryout or delivery!